Today for the Food Network’s #FallFest, we are using seasonal produce to create spooky and fun treats just for you! When I first heard today’s topic, I immediately thought of the combination of orange and black and wondered what I could come up with. The Artist and I were chatting about what I could make (he is a great source for very creative ideas!) and after laughing at a lot of silly combinations, I realized exactly what I wanted to make for you … a beautiful blend of flavors and colors, perfect for your holiday party and an absolutely delicious, creative way to serve two of my favorite soups! 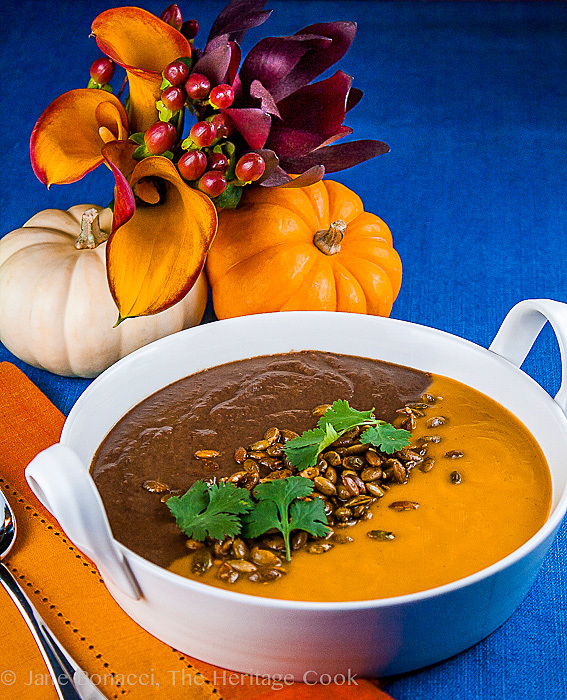 The “black” portion of the soup bowl was easy, my go-to black bean soup that is rich and packed with tons of Mexican flavors. One of my favorites since I had my first bowl at the venerable Chez Panisse back in the 80s, it is perfect all winter long for filling lunches and dinners. If you like spicier food, you can either add more chiles en adobo or some cayenne pepper. You can also pass hot sauce at the table for your guests to add to their own preferred level. My original thought for the “orange” portion was butternut soup, but that is more gold than orange. While I love the flavor of butternut squash soup, especially during the holidays, I wanted to boost the color and decided to add another of my favorite soup ingredients, carrots. The combination of squash and carrots is truly remarkable, very soothing and satisfying, perfect for cold days throughout the winter and spring. Thanks Whole Foods Market for the gorgeous produce and flowers!! Both of the soups are delicious on their own and you can serve either one at seasonal parties, brunches, lunches or dinners. It would be fun to make both and offer your guests their choice. If you want to serve them in the same bowl the way I did, the secret is to have both soups as close to the same consistency as possible. Fill two measuring cups with spouts with the soups and pour at the same time into opposite sides of the bowl. This is easiest with two people unless you are ambidextrous and really steady! In the recipes I have given you several options for garnishing. You can use any of those that you like when you are serving these soups. For today’s blended soup, and given the Halloween holiday, I decided to garnish the soup with some dukkah-seasoned pumpkin seeds. They are incredibly easy to make. Just place them on a foil-lined baking sheet, drizzle with olive oil and sprinkle with salt and dukkah seasoning. Use a spatula to carefully mix the seeds around, making sure they are all coated with the oil and seasonings. Spread them back into a single layer. Bake at 350°F for 5 to 8 minutes or until they become fragrant and barely start to become golden brown. Remove from the oven and let cool. Taste and add more seasonings if desired. Buy shelled pumpkin seeds if you can find them! Don’t be afraid to use seasonings in these soups. The main difference between professional chefs and home cooks is the amount of seasoning they use. The pros use a lot more salt, pepper, herbs and spices than you would imagine. It is often what makes the difference between an ordinary meal and an outstanding one. I hope you have a wonderful Halloween and get lots of adorable little Trick or Treaters knocking on your door. Stay warm and when you get back with your bag of goodies, have these soups hot on the stove and ready to warm up your little ones! Make sure you check out the other recipes below and see the creative and wonderful recipes my friends have shared! In a heavy-bottomed large stockpot or Dutch oven, heat the oil over medium-high heat. When shimmering, add the onions, bell peppers, and celery. Cook, stirring often, about 5 minutes or until vegetables are softened. Reduce heat to medium and add the garlic, oregano, cumin, cocoa powder, salt and pepper. Continue to cook for another minute or two, to let the garlic cook and seasonings blend. Stir in the water and scrape up the fond from the bottom of the pot. Stir in the beans, bring to a boil over high heat, reduce the heat to low and simmer for 15 to 20 minutes or until the vegetables are tender. Remove from the heat and, using an immersion blender*, puree the soup until smooth. Whisk in the lime juice, taste and adjust seasonings. Fry Tortilla Strips: Set up a baking sheet with sides next to the stove and line with paper towels. Set a wire strainer next to the stove. In a medium saucepan, add about 1 to 2 inches of oil. Heat over medium-high heat to 375°F. Use a candy thermometer or Thermapen to monitor the heat of the oil. Working in small batches, fry the tortilla strips until the edges begin to get crispy. Use the strainer to transfer the cooked strips to the paper towel-lined sheet. Sprinkle lightly with kosher salt. Repeat with remaining tortillas. To Serve: Ladle soup into warmed soup bowls and garnish with fresh cilantro green onions and fried tortilla strips. Serve hot. *You can also use a blender; puree in batches, leaving the lid slightly ajar, holding it steady with a kitchen towel over the top to protect yourself from splashing hot liquid. Never fill the blender more than half full with hot liquid because the will expand dramatically and can burn you. Transfer back to the stockpot to keep warm. By © 2013 Jane Bonacci, The Heritage Cook. All rights reserved. Prep the Butternut Squash: Rinse the squash under running water and pat dry. To make it easier to work with, cook it slightly in the microwave. Use a paring knife to poke several holes in the squash to release the steam and microwave on High for 8 minutes. Use an oven mitt to remove the squash from the microwave and place it on a cutting board. Let sit until cool enough to handle. Using a sharp, large knife, cut the “neck” of the squash off. Set the rounded end on the cut surface and cut in half, revealing the hollow center. Scoop the seeds and strings out of each half and discard. Using a vegetable peeler or your knife, remove the skin from the squash. Cut squash into cubes and transfer to a bowl. Prep remaining vegetables and place in a second bowl. Cook the Soup: In a large stockpot, over medium-high heat, heat olive oil and butter. When the butter is melted, add the carrots, celery, onions and bell peppers; stir to coat evenly with the oil. Sauté 2 to 3 minutes, stirring often until the vegetables are softened but not browned. Add the squash, broth and water. Stir in the salt, white pepper, curry powder and sage. Bring to a boil, and then reduce heat to low, cover and continue cooking until vegetables are fork tender, about 15 to 20 minutes. You should be able to easily break the squash cubes in half. When done, remove pot from the heat and let cool for 5 minutes. Using an immersion blender, puree soup in pot. You can also use a blender; puree in batches, leaving the lid slightly ajar, holding it steady with a kitchen towel over the top to protect yourself from splashing hot liquid. Never fill the blender more than half full with hot liquid because the will expand dramatically and can burn you. Transfer back to the stockpot to keep warm. Taste and adjust seasonings as desired. Stir in the cream just before serving. For the Garnish: Wash the sage leaves and pat dry thoroughly with paper towels. Set a plate next to the stove and cover with a couple layers of paper towels. Set out a pair of tongs. Heat the oil in a skillet over medium heat. When it is shimmering, add a single layer of sage leaves, making sure that there is plenty of room between each one. Fry, watching carefully and turning with tongs as needed, until crispy. Use the tongs to transfer them to the paper-towel lined plate. Immediately sprinkle lightly with kosher salt. Repeat until all the sage leaves are cooked and salted. To Serve: Ladle the soup into warmed bowls and place 2 or 3 fried sage leaves on the top of each bowl. Serve immediately. Make sure you check out all of these remarkable recipes from my blogging friends! Unauthorized use, distribution, and/or duplication of proprietary material on The Heritage Cook without prior approval is prohibited. This includes copying and reprinting content and photographs. If you have any questions or would like permission, I can be contacted via email at theheritagecook (at) comcast (dot) net. Feel free to quote me, just give credit where credit is due, link to the recipe, and please send people to my website, www.theheritagecook.com. Please see the Disclaimers page for additional details. Nice job Jane! You must have worked late last night considering I saw you purchasing your ingredients and flowers at Whole Foods at nearly 5pm. Gorgeous soup Jane – very creative and I love the pumpkin seeds on top! 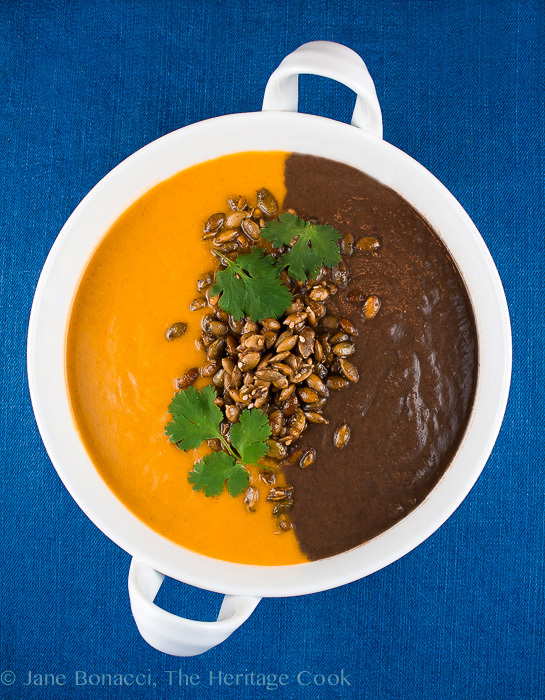 What a wonderful idea with a carrot soup and spicy black bean soup….and pouring it into the bowl all at the same time to create a Half and half bowl of soup…. I do this method with a spinach and roasted red bell pepper soups….people are always in such ahhhh when they see how simple one makes that happen….